Here at Ellicott City Sew Vac, trade-ins are a big part of our business. That means we often have great deals on pre-owned Babylock sewing machines, sergers and embroidery machines! The best machines don't stay long, but we'll be posting what we have available in this space. Check back often, we get new trade ins all the time. This Coverstitch is a steal at $599.95. 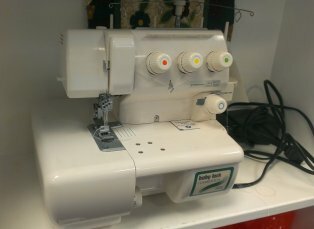 If you already have an overlock machine, adding the coverstitch will make professional looking hems a breeze. The looper threads itself and the needles are easy to thread too. This one is in great shape, includes 5 years free service and unlimited lessons. 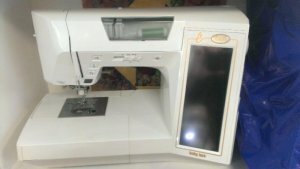 The Espire is a wonderful sewing machine, with enough space to quilt in! 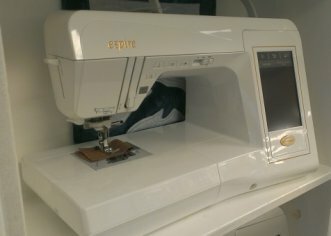 The Espire has top of the line features like pivoting, a fabric sensor system, hundreds of utility and decorative stitches, and of course 5 years free service and unlimited lessons! The original Ellageo was a classic. First machine with a color screen, largest embroidery field of it's day, first machine with a floppy drive, the list goes on. Still a great machine.